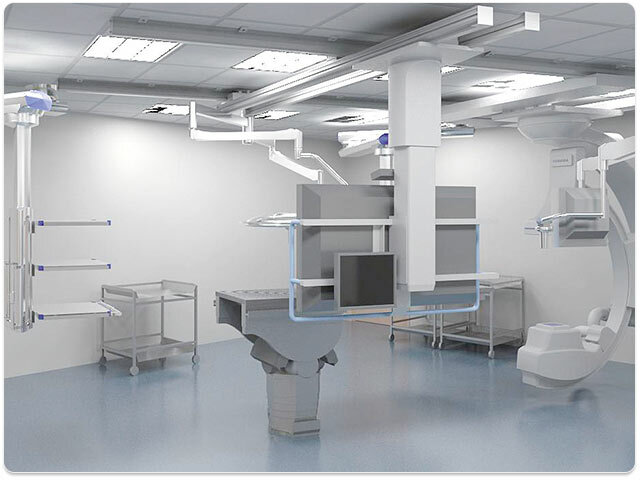 At Canon we fully understand the enormous task of replacing or redesigning a complex examination room within a very busy clinical environment. With each system we will provide a dedicated and professional project team to ensure every aspect of your requirements are understood and ultimately met. We have worked very closely with Canon throughout the planning, design, build and implementation of these theatres, which contained many novel features and first installs. Thus, plans changed significantly throughout the project. Canon has been a fantastic partner in achieving to install these benchmark theatres on time and within budget. Photorealistic 3D renderings can give you a perfect impression of your new facility already in the planning phase. Our drawing department is dedicated to planning the best layout for each individual installation. Our draftsmen design your space addressing any potential issues, bringing together the best solution in the shortest possible time. We are also leading the way with 3D room layouts, giving you a real perspective on the room already in the planning phase. From day one an project manager and lead engineer will be assigned to your project. This allows you to get to know your local team and allows us to fully understand your needs both during the installation and in clinical use. You will also get to know your local clinical applications support, who will help and train your staff to get the most from our systems. At Canon we strive to produce cost effective and beautifully completed rooms by working very closely with your team and hospital specific building contractors. With a full in-house design and build service we are able to undertake any form of build works at your facility, resulting in the perfect clinical environment for yours and your patient’s needs.